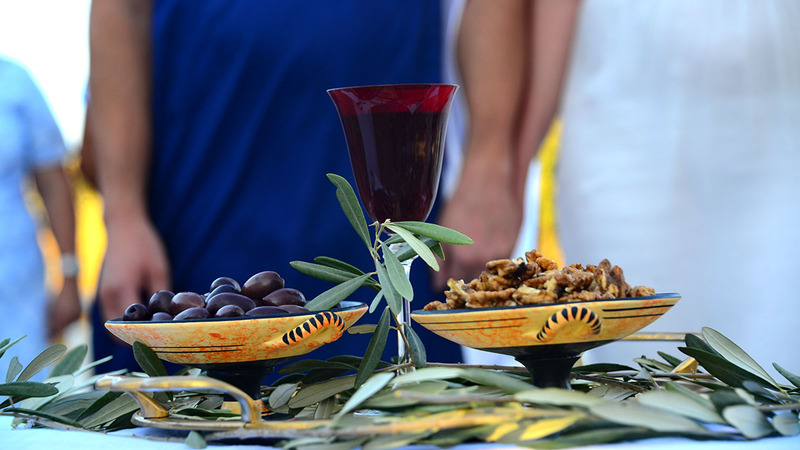 For many couples a civil wedding ceremony in the hotel on Crete is a beautiful tradition. You can perform the most romantic scenarios and take unbelievable pictures in the most comfortable interiors with unique design elements having top-class services. Within the frameworks of the present wedding package we offer you to plunge into the world of antiquity with white tunics and golden girdles, sophisticated haircuts with free-flowing locks, laurel wreaths, silver cups, diadems and fabulous fresh flowers. 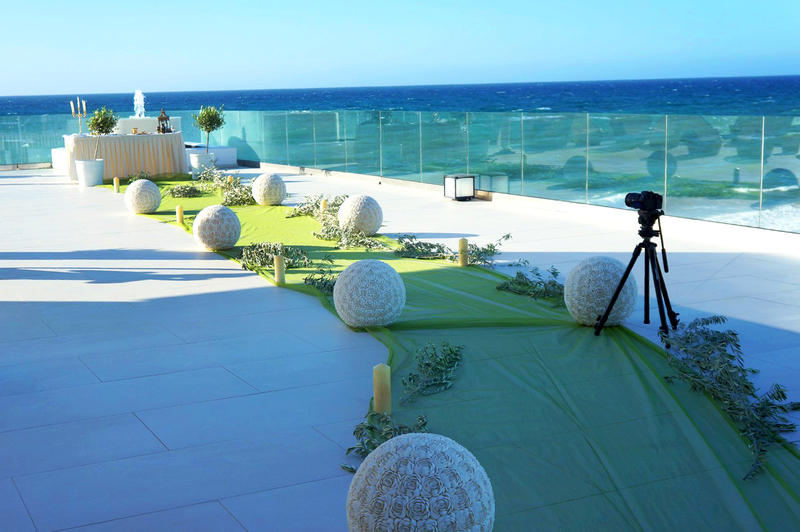 Although, the advantage of a wedding ceremony in a hotel on Crete is in its diversity. Here you can most effectively realize any style and concept and meet any expectations. 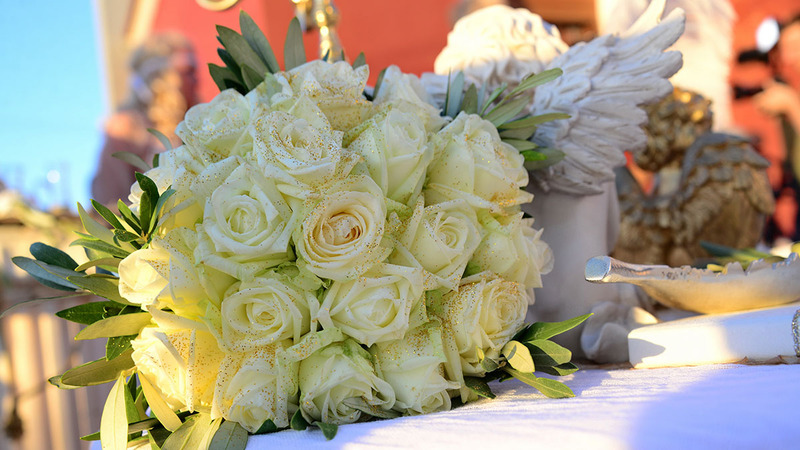 It is the most complete package of services from the rich wedding collection we offer for a civil ceremony organization in Greece with expanded content of high quality. It is also convenient since it also includes documents arrangement. So, you can relax upon your arrival to Greece and according to your wedding coordinator register your marriage officially. 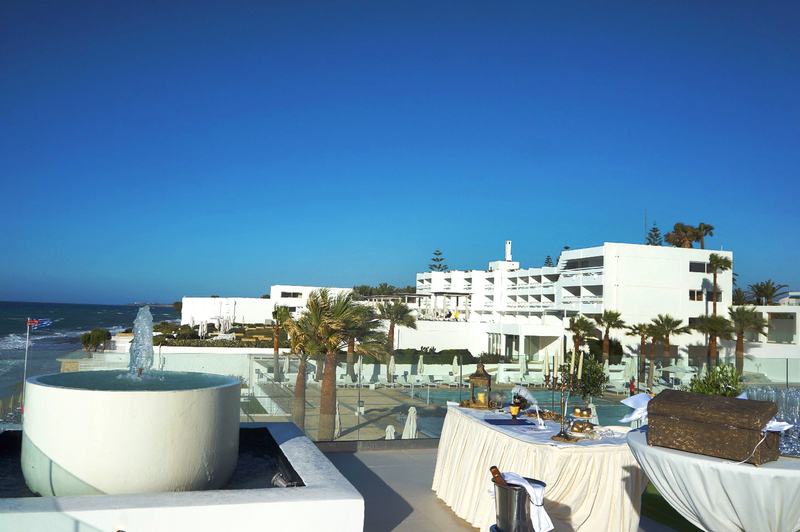 The wedding package is available in such resorts as Crete, Rhodes, Halkidiki and Thessaloniki. We offer several extra services, in order to make your wedding bespoke. Decoration elements mentioned in the package are: lanterns, runners, table cloths, chandeliers, candles, tea –candles, pleated hearts, vases, fabric etc. 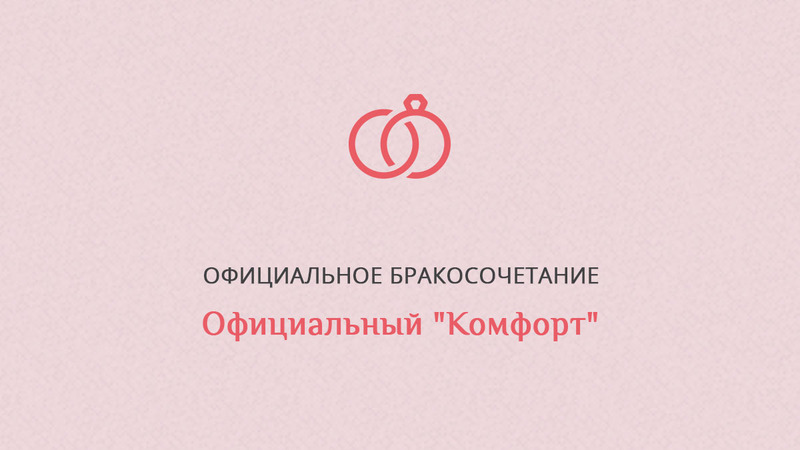 The elements are to be chosen according to the venue and in collaboration with the wedding planner. Our wedding coordinator can meet a couple before the ceremony either in the hotel they are staying in or in our office. This meeting is possible only in case the hotel sits not far from the office of our company. The price is calculated for 10 participants. If you have more guests, you should add 25 euro per guest. This includes extra rose petals, water, koufeta, bonbonieres for each guest. Our experts will take care about the paperwork, translations, certification, and wedding licenses. 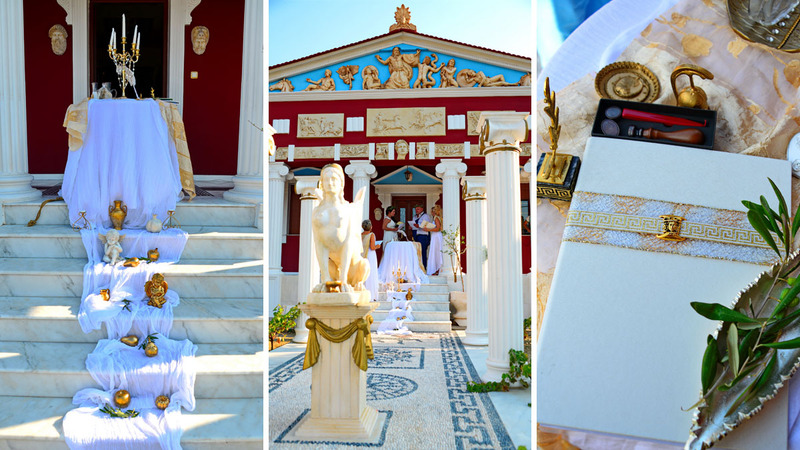 Upon completing the ceremony you will be handed in a wedding certificate in Greek. It needs to be legalized by translating it into your native language and taking it to your register office. Would you like to feel like powerful Olympian Gods in an atmosphere of harmony and beauty? This antique theme wedding in Greece is exactly what you need. Its uniqueness lies in its authenticity. After all, the country’s culture is the source of antiquity and represents divinity, majesty and nobility. As a part of the ceremony we will create a spectacular show where the main heroes will be a couple wearing white elegant gowns with golden highlights. 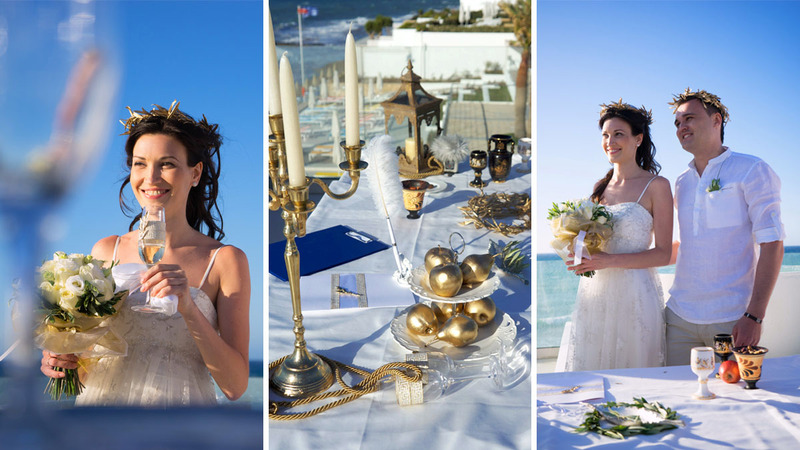 The accessories of the ceremony will be laurel wreaths, busts, columns, draperies, flower bracelets, tiaras and amphorae. The sounds of the Greek traditional music will be everywhere that will create a special mood, which once reigned on the top of Mount Olympus. This package is available on Rhodes & Kos, Crete, Santorini, Mykonos, Peloponnese and Attica. The decoration elements consist of the basic elements for the ceremony. To make your wedding more individual and special we offer to use the extra services.